Whether one has a love of great seabirds or just an interest in the lives of these magnificent creatures, the website of the journal Marine Ornithology is well worth a visit. 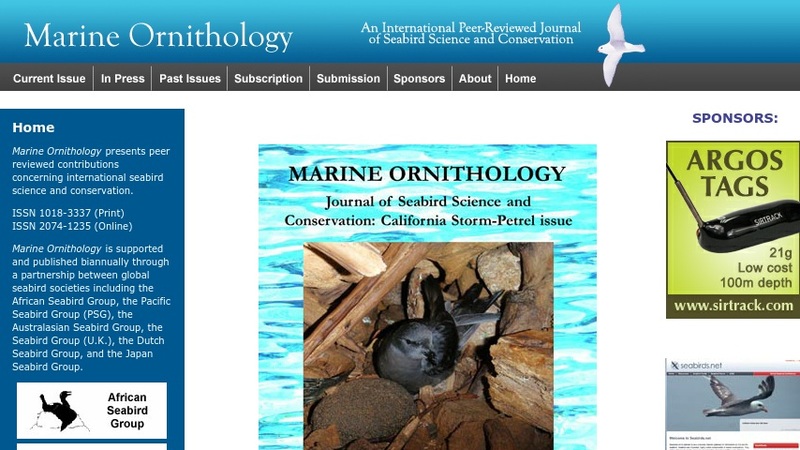 Started in 1976 by John Cooper, the journal is operated by an editorial board, under the direction of the Pacific Seabird Group, along with other related organizations. Visitors who may wish to contribute a piece to this peer-reviewed journal may want to take a look at their submission requirements and then proceed to the contents of the most recent issue. Some of the more recent articles in the latest issue deal with such topics as parasites and diseases of the auks and aspects of the breeding biology of the Gentoo penguin. For those looking for back issues, the full-text of every past issue dating back to 1988 is also available on the site.